Who loves checking things off? I know I do. And everyday when I look in my planner I see this little sticker at the bottom of each day, just waiting to be filled in. I never work out, consistently, ever. My fiancee says I do one workout a year. I hate it. So if I can do this 30 day challenge, so can you! It has been 9 days since I've started this challenge. I wanted to quit since day 3, but everyone says that the 2nd and 3rd day are the hardest. So true. I love this challenge, it takes me about 10 minutes to get through this whole workout. I do it every day and I'm not super tired but I definitely feel it. My legs are super stronger now and I feel a lot better about myself. I found this idea after searching 30 day challenges on pinterest. There was a squat challenge, an ab challenge, a push-up challenge, a lunge challenge, a plank challenge, and so much more! But I was like, I don't want to do just one challenge! That would hardly be a workout! 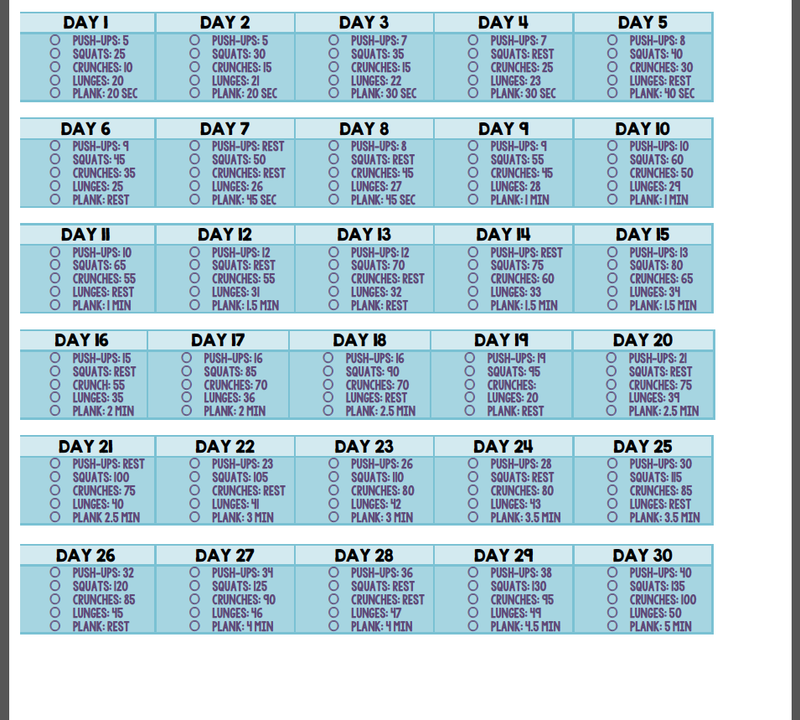 So I combined them all to make a 30 day fitness challenge instead! So I did the long, tedious part of putting it all on one form for ya'll, so the least you can do is try it out! It's so easy and fast! At first I was like no way I can do 50 squats, but now I push myself to get to that next level every day! It gets easier every day, but challenges you to do more every day! It is so awesome. Whoever came up with this is so awesome! click here to download these workout stickers! I printed them on Avery sticker paper and cut them out myself. check out all those filled in circles! feels so good to do that EVERY DAY! Next month I might make a different workout challenge like for lower abs, side lunges, and whatever else I can think of...Don't want to stop after 30 days! look at all those filled in bubbles! Yeah! I was just curious what Avery stickers you printed these out on?